Jacksonville Stained Glass Inc. officially opened July 1, 2017 due to the closing of Jacksonville Art Glass. 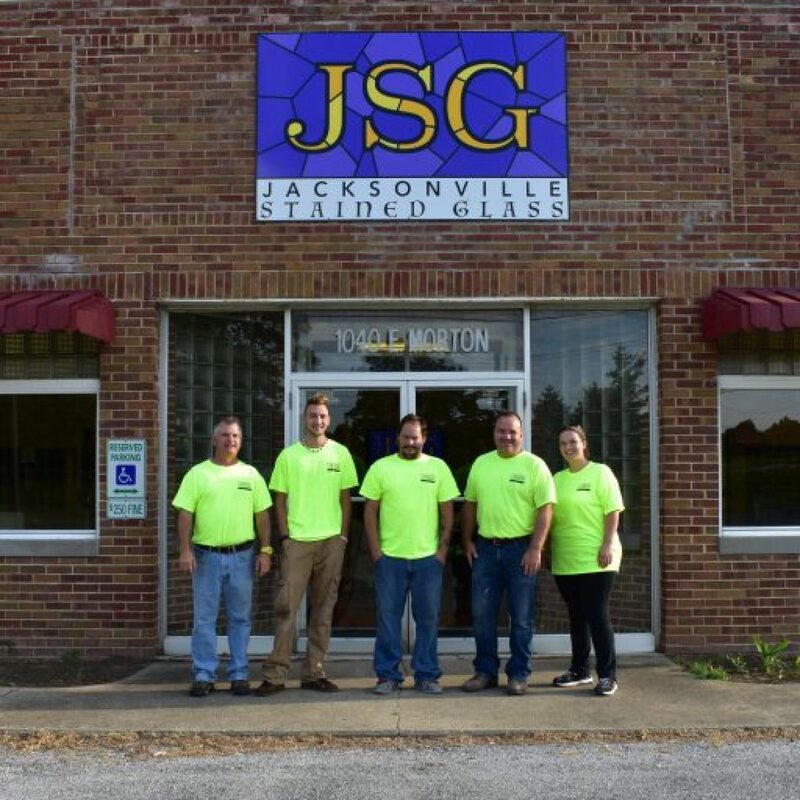 Jacksonville Art Glass enjoyed many years of successful operation in the stained glass restoration field, led by owner John Krol. Krol is now enjoying retirement and has passed on the tradition of excellence to new owners Ron Weaver and Bill Preston. Weaver and Preston will continue to service the area between Chicago, Paducah, Indianapolis and Kansas City. Their location in central Illinois provides easy access to churches requiring their services. Jacksonville Stained Glass is a full service studio. We offer traditional stained glass restoration, design and creation of new stained glass windows, hand painted kiln fired glass from our art department and custom fabricated storm glazing protection. Jacksonville Stained Glass offers completely free, expert window inspections. A phone call or email to Bill or Ron will result in a visit to your church. 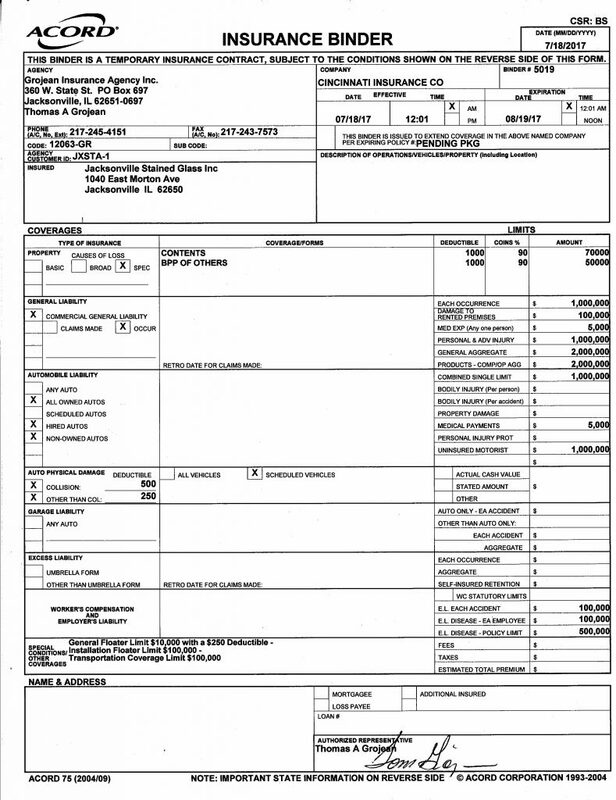 We carefully inspect and evaluate your windows and offer a report of condition. 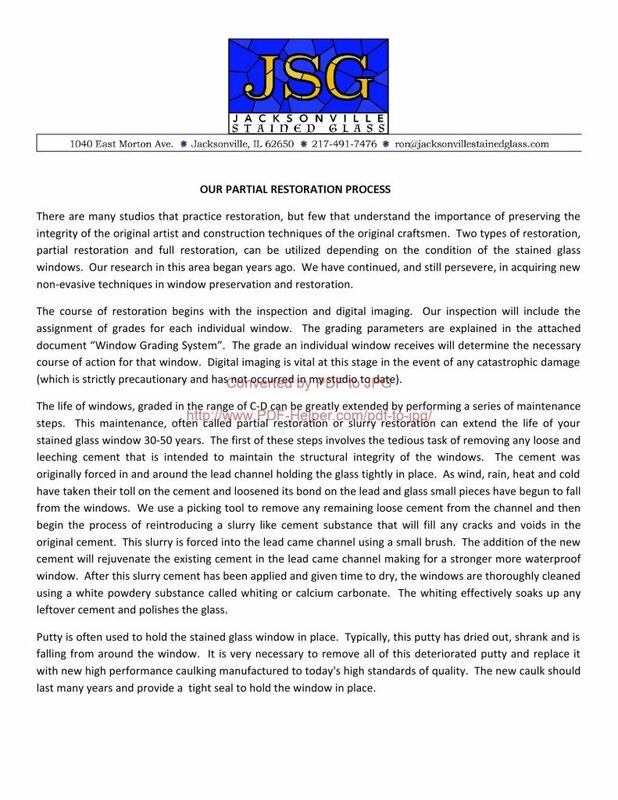 This report includes interior and exterior photographs, all windows graded by condition and any recommendations for conservation that might be in order. 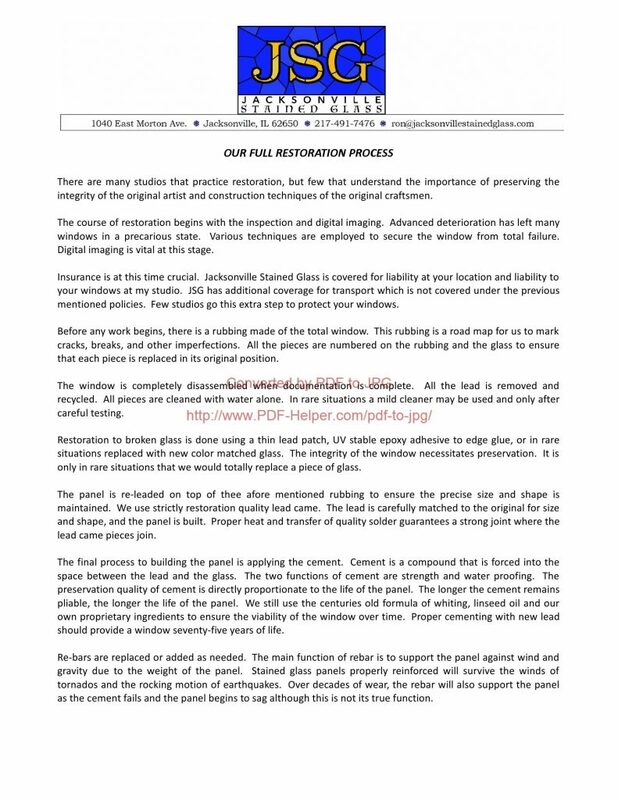 Our hands on approach will educate you and your committee on the art of stained glass restoration. 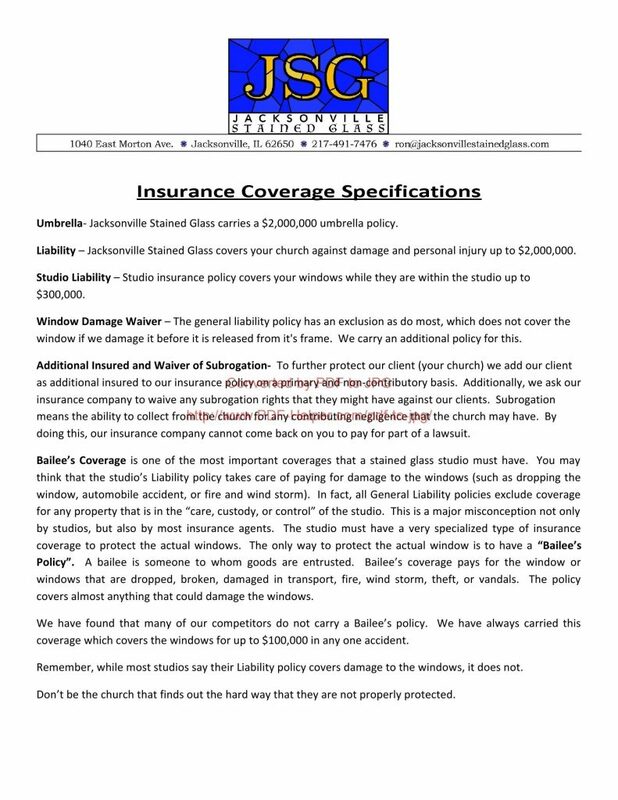 Jacksonville Stained Glass is fully insured by Cincinnati Insurance Company. Your windows are 100% insured while we are on site at your location, while in transit to and from our studio and while they are in the process of restoration in our studio. We furnish the following certificate of insurance and name your church or diocese as additional insured for every project we undertake. The existing condition of the stained glass window will determine the method of restoration that we will propose. Most often, windows less than 60 or 70 years old can be addressed using our Partial Restoration Process. This method is less intrusive than our Full Restoration Process and much less expensive. Fortunately, for your church, we are experts in determining which method should be undertaken in the best interest of your windows. Shown below are detailed explanations of each method of restoration. After spending thousands of dollars on stained glass restoration, many churches elect to install new storm glazing protection on the exterior of the church. We use a heavy duty extruded aluminum frame system to provide many years of maintenance free use. The frame is fabricated in our studio and can be a structural element to the window opening if the existing conditions warrant. Our goal when designing this frame system is allow it to mimic the sight lines of the stained glass window frame. The more “invisible’ the frame is, the better we like it. We inset small hooded vents to allow convected air to circulate in the micro climate space between the stained glass and the exterior storm glazing. This reduces condensation and heat buildup in the micro climate space. To aid in the blending of the exterior storm glaze frame we powder coat it to match color of the stained glass window frame. Typically, we glaze the opening with 1/4” plate glass. Sometimes more protection is needed and we can use tempered glass or laminate glass to glaze the opening. 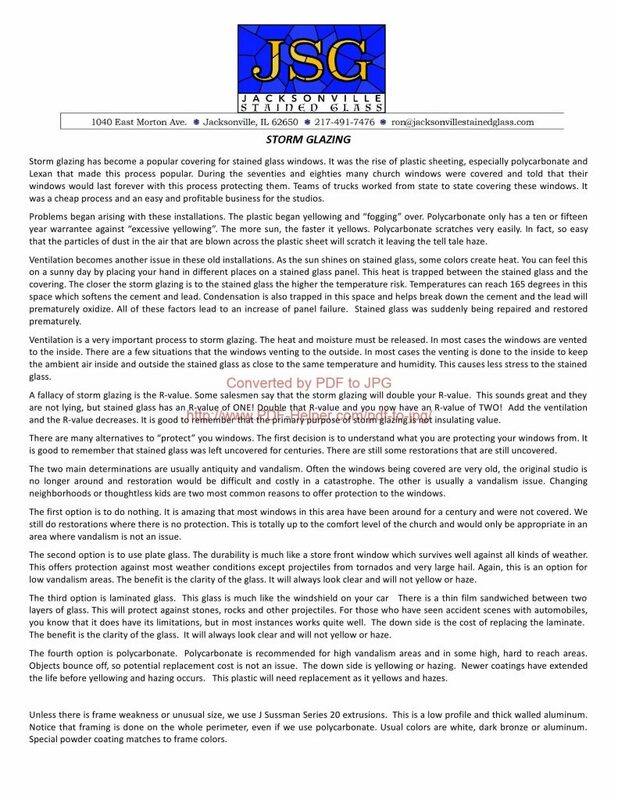 See below for more information on Storm Glazing.